Welcome to the AMBS Library! I like to say that if you're quiet enough, you'll hear the books in our library talking to each other: they represent a longstanding theological conversation. It's my pleasure to invite you to join this conversation through your own research and writing. We are here to help you be rooted in the Word and growing in Christ as a leader for God's reconciling mission in the world. You can find us by Googling "ambs library" or via the direct URL ambs.edu/library. 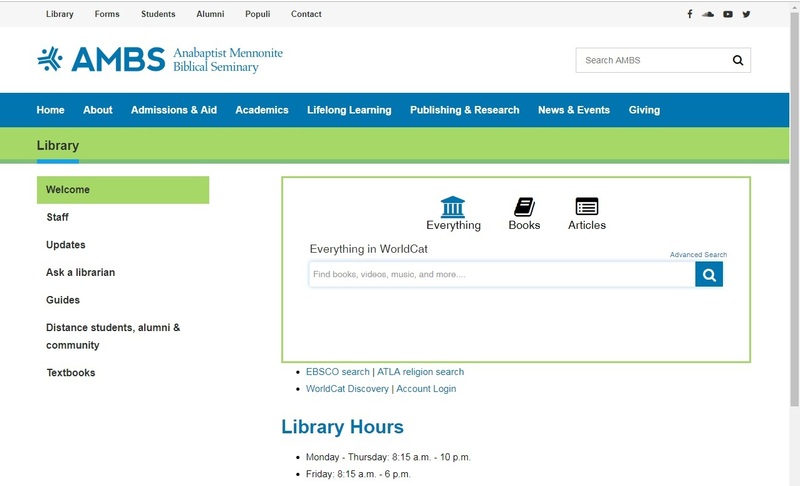 Every page of the AMBS website has a link to the library in the gray bar at the top. You can also use the Library Resources block in Moodle.